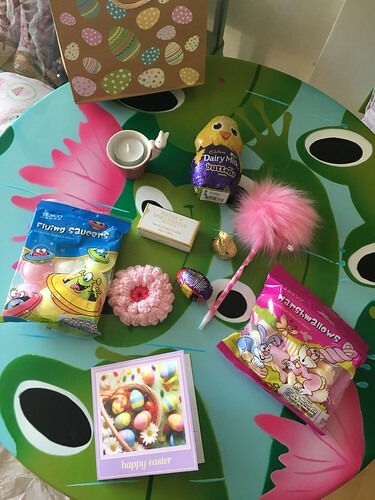 t*rexes and tiaras: Easter Swap Parcel.. So, it's safe to say that I love a good snail mail swap - I'm always up for putting together a pretty letter or a parcel for somebody. 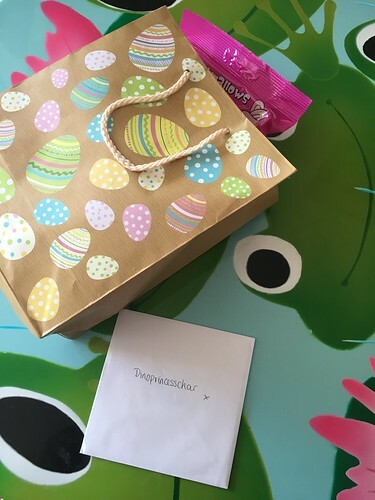 I signed up to a lovely themed swap hosted by one of the people I follow on Instagram and although I'm hopeless and failed to photograph my parcel before I sent it out, here's the exciting one which I received from my swap partner, Rachel. Lots of sweets and chocolate which I packed to take with me on the journey to the airport on Thursday, because early morning airport runs often need snacks.. A fluffy pen, which is awesome and the cutest little brooch (which I think is handmade). In my parcel, I also hand-knitted something, from this tutorial and was amazed by just how simple it was to complete.